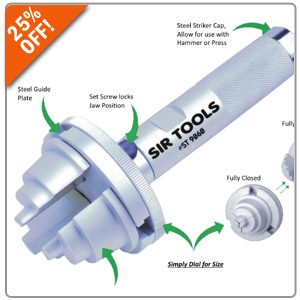 25% OFF New Product From Sir Tools at Pelican Parts! This specific tool has been recently added to the catalog and is designed as a quick and easy installation tool with a three stepped jaw. If you need help with seals, wheel bearings and more this is the tool for you as it is an all-in-one, universal and fully adjustable 3-jaw press/driver. It is durable as it’s made from tempered aluminum with a steel striker cap so you can put your mind at ease about this quality tool- and now take 25% OFF when you enter promo code SIR25 at checkout.